When author James C Wallace II read my post last week about buying a cat Totem Orb, he sent me the photo above of a similar purchase he felt drawn to make. James said: "I read in your blog about the cat meditation ball and how it seemed to call out to you. I had a similar experience back in the 90s when Amanda and I were visiting Wounded Knee, site of a massacre back on December 29, 1890, on the Lakota Pine Ridge Indian Reservation in South Dakota. 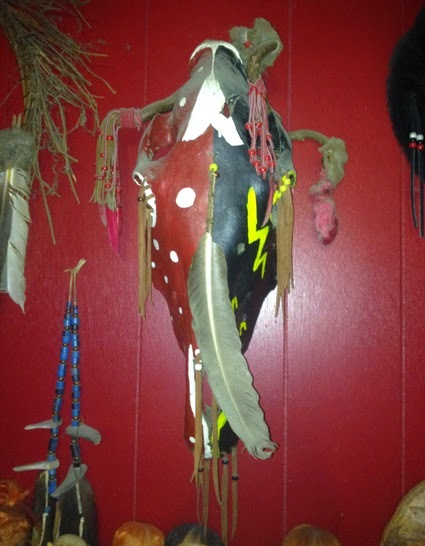 We were in a small restaurant called The Wooden Knife when this horse head totem called out to me. Damn thing wouldn't shut up, so I asked about it and when it turned out to be for sale, I bought it. We've had it ever since." If any one else who reads my blog wants to send me photos of beautiful pagan or shamanic items they have felt particularly drawn to, I would be happy to put them on a Pagan Eye post.